As the economy turns, Detroit auto executives are back on Capitol Hill arguing their case for a bailout of their companies. While Congressional leaders have developed a nasty habit of putting on ridiculous publicized corporate CEO scalpings to feed to the rabid proletariat which really don’t address the actual economic issues at hand (such as the over-the-top uproar about the fact that the auto executives took private jets to Washington last month – I understand it wasn’t the greatest move from a PR standpoint, but the problems in Detroit have very little to do with the existence of corporate airplanes), it will hopefully result in absolutely no bailout for the automobile industry. We can take up an entire business book aisle at Barnes & Noble about the reasons why a bailout would do nothing to change the fundamental business issues, but I’ll just address a handful of them. At the top of the list, the auto industry’s issues were not caused by the current credit crunch – the problems with credit have only exacerbated items that the Big Three automakers have failed to change for nearly four decades. Simply put, Congress propping up the American auto industry isn’t going to get people to want to buy American cars. My wife and I own a Toyota and a Mercedes-Benz, and I have to say that the performance improvement of those cars over the GM and Chysler cars that we used to own have made the likelihood of us ever buying an American car again essentially zero. I know plenty of people that would say the exact same thing (and these aren’t Lincoln Park chads and trixies or Naperville yuppies – I’m talking about blue collar people who would have always bought Chevys and Fords back in the day). The combination of mileage, maintenance, and performance of the Japanese and German cars since the 1970s have vastly surpassed their American counterparts. 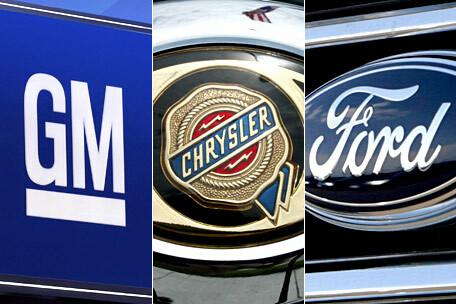 For far too long, the Big Three automakers have relied on guilting Americans into thinking that they have some type of patriotic duty to buy their cars (even though Toyota and Honda are actually the car companies that are expanding production in the United States as opposed to the Big Three) instead of improving their product. While Detroit has attempted to catch up to the Japanese and German automakers in quality over the past few years, it’s a classic case of “too little, too late”. The decades of neglect have made a close to irreversible dent in the perception of the Big Three where it is directly reflected in their resale values. Outside of UAW enclaves in Michigan and Ohio, people are pretty rational consumers of cars overall, particularly when it comes to the second-most expensive household purchase after a house (or the most expensive purchase for those who rent). If a Toyota sedan is about the same price as a Chevy sedan, but the Chevy depreciates in value 2-3 times faster than the Toyota, then more people are going to move toward the product that is going to keep its value longer (much less get a couple hundred thousand miles of low maintenance use out of that product). The current poor economic conditions have heightened these problems but they aren’t the root cause of them, which is why government assistance would merely put off the inevitable for the auto industry. If the Big Three couldn’t get their act together over the course of four decades, then I have absolutely no faith that they would be able to change a thing over the course of a three month bridge loan. A common argument among supporters of the auto bailout is that Congress has already done the same for the financial industry. This is certainly a fair argument as the government has now gone down the dangerous path of judging which companies are deemed “too big to fail”. However, there are some key differences between the banks and the automakers. The broad issue with the financial industry is that each major bank has literally millions of transactions with the other major banks such that the flow of money in both this country and around the world is closely intertwined (whether this is right or wrong is a discussion for another day). Thus, the failure of a single major bank could endanger the liquidity of healthy (or at least stable) banks that are on the other ends of those transactions. It then becomes a vicious circle, where each bank whose balance sheet is suddenly thrown up in the air then causes the balance sheets of many other banks to suffer, as well. This leads to both consumers losing confidence in those banks by withdrawing their deposits and banks then stopping the flow of credit since they don’t have any liquidity. As a result, entities ranging from individuals looking for credit cards and huge corporations searching for business loans can’t find any credit, causing overall spending and investment in the economy to grind to nearly a complete halt. Indeed, if the federal government could change one thing over the past couple of months, it would not have allowed Lehman Brothers to fail since their filing for bankruptcy started this circular financial drain almost immediately. At the end of the day, the American economy is driven by the flow of credit, so the financial industry was indeed “too big to fail” in this case since the repercussions went far beyond those wealthy Wall Street bankers and lawyers. It has always driven me nuts when the media intimated that there was some type of line of demarcation between “Wall Street” and “Main Street” as if they had conflicting interests. The fact of the matter is that Main Street can’t function from a financial perspective, whether it’s using your credit card to buy groceries, getting a student loan to go to school, or obtaining a mortgage to buy a house, without a healthy Wall Street. As large as the auto industry might be in this country, it doesn’t have the same impact on every single person in the United States in the same manner as the financial industry. This isn’t to ignore the impact of auto industry on millions of people that either work for the Big Three or are peripherally impacted as suppliers and providers of support services. That being said, the UAW leaders need to understand that it’s no longer about what higher-than-market wages their locals are able to maintain – it’s now about whether their union members are going to have any jobs at all in the next few months. Until both executive and union leaders come together to figure out how to trim costs, come up with better products, and have wage and production flexibility that is up to speed in the information age as opposed to the industrial age, any government assistance to the auto industry would simply be throwing money away. Filing for bankruptcy is actually one of the best ways for force all of those stakeholders to come to the table (and it doesn’t mean that anyone will go out of business – United Airlines didn’t stop flying planes or layoff all of their employees just because it went into Chapter 11 a few years ago and the company is in better position today to survive a tougher economic climate as a result of its restructuring). A government handout, however, would simply put off the tough changes necessary to make the Big Three to be viable again further into the future.